Composed of 26 barangays, Pili is the 2nd largest municipality in Camarines Sur when it comes to population. It is also the capital of the province and considered as one of the municipalities in the metropolitan area of Metro Naga which is the center of agriculture and industrial developments in this part of the Bicol region. Pili became a municipality in 1919 and became the capital of the province in 1955. There have been many stories that have been associated with its name. The most popular of these etymologies is the belief that its name came from the Pili nut, a fruit that has become a symbol of the region. But some historians say that the word “pili” is a word from Bicol that means “chosen”. The town was said to be christianized in the 1770s. It was due to the construction of the Philippine National Railways in the municipality that Pili became a center of commerce, next to Naga. Pili has what is called a waterfall circuit with around eight waterfalls. Located in the canopied forest of Pili, the site boasts of several attractions such as wartime tunnels and a Japanese memorial. Going there requires you to sign on a logbook and hire a local guide. Jump-off to the waterfalls is in Barangay Curry. Going to the first three catch basins of shallow water is by passing through a river crossing. The trail is not that difficult for someone who has experienced some wall climbing but for a first-timer, it can be a bit challenging. The fourth cascading waterfall is known as the Twin Falls. This is just a small cascade the separates as a fork because of the rock formations. The last and the highest waterfalls, the Shower Falls, is narrow but flows down from a towering cliff full of vegetation. These comprise of barangays near Mt. Isarog and the tourist attracton here is the Tinagrawan Falls or Tinangis Falls and Balang Falls. This is also wher e the 9th Infantry Division of the Philippine Army is located and known as Camp Elias Angeles. The town of Pili as well as Metro Naga gets water from this part of the region. 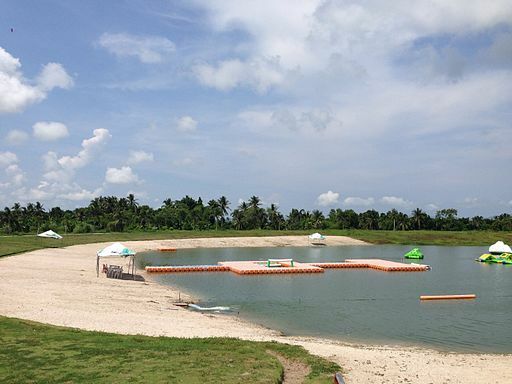 This is the go-to destination if you want to enjoy extreme water sports. 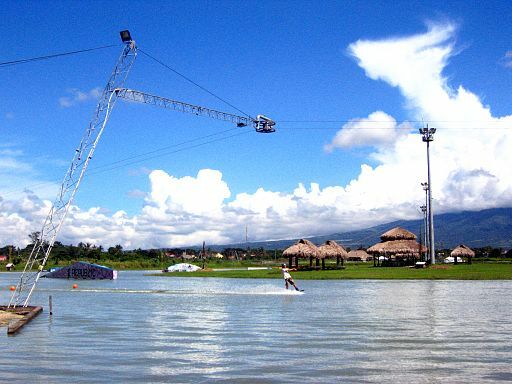 Located in the Provincial Capitol Complex in Cadlan, Pili, this park is the favorite destination for tourists who want to learn wakeboarding and enjoy other activities like waterskiing and wakeskating. There are four ways to go to Pili, Camarines Sur. If you prefer a bus ride, you can go to the bus station located in Buendia and ride a bus going to Camarines Sur. Fare is between P700-850, one-way. You can also take a plane from Manila to Naga. For a different adventure, you can take a train from Tutuban to Naga. For a road trip in your own car, expect to be on the road for about six hours.